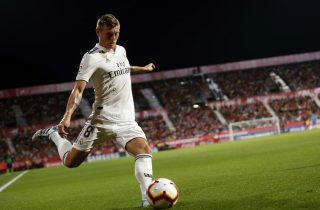 Manchester United have seen their odds on a deal for Real Madrid midfielder Toni Kroos slashed amid fresh speculation about the German’s future. According to Ladbrokes, United are now just 7/4 favourites to sign the World Cup winning star having been priced at 5/1 previously. What forced the odds to be slashed is beyond us. Kroos would still cost United a lot of money if a deal was to materialise, but how long has the 29-year-old got at the highest level? However, I would be very surprised if Mr. Apati or any of the figure heads at Ladbrokes have any inkling of what’s going on at United or most football clubs for the matter. This could easily be an attempt to fool people into placing bets on Kroos joining United. They won’t be getting our money! After falling for duds in the past – Bastian Schweinsteiger – the last thing we need now is another past it signing who is looking for his last big career move. The Germany international was sent spinning during Sunday night’s Euro 2020 qualifier against the Netherlands. Frenkie de Jong was able to show Barcelona fans what to expect next season, especially if Kroos remains at Real Madrid beyond the summer.